The UK's leading distributor of Heating and Bathroom Products. 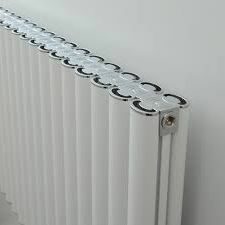 Aeon Visage Radiator one of the Aluminium Range; White finish a stock item, other colours and finishes available (Black, Matt Silver & Chrome) for special order 6-8 weeks, please ring for availability. Aeon Visage Aluminium Horizontal Radiator White Finish; all in the detail. The curved panels and attractive patterns make this aluminium radiator irresistible to the touch and pleasing to the eye. Affordable designer elegance at your fingertips. One of the Aeon Aluminium range. White finish a stock item, other colours and finishes available (Black, Matt Silver & Chrome) for special order 6-8 weeks, please ring for availability. Additional items may be required to install this product correctly and standard items have been pre selected for ease of use. Please expand the links below to either de select the items or choose any alternatives you may require. Click link to view full picture. Our standard delivery charge on all orders to mainland UK are free (Except Radiators). Unless your order is below £100.00. Delivery applies to UK Mainland only. Postcodes KY.PA1-18.FK.AB.DD.KW.PA-19-40.PH.IV will incur extra delivery charges. Next Day items must be items currently in stock and held at our distribution warehouse. Orders must be fully completed and T&C agreed to no later than 11.30am for a next day service. Please note: For larger pallet items on any order date, orders must be placed and accepted before 11.30am. Next day delivery may be charged please call sales to check availability. 10 Years Manufacturer's Warranty as standard. manufacture's T&C apply.